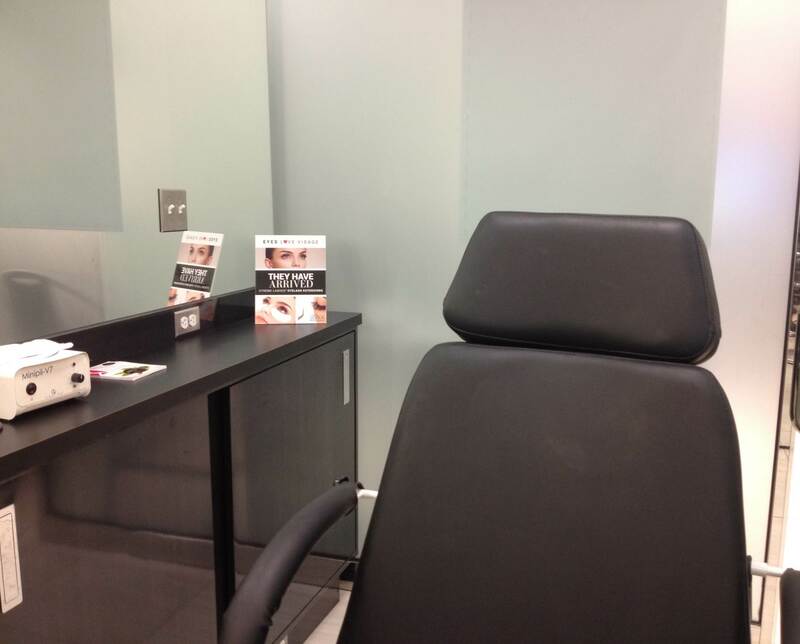 When I booked my (complimentary) lash extension service at Caryl Baker Visage at Bayshore Shopping Centre, I pictured myself on a stool for twenty minutes or so. I thought the process would be like getting a manicure — a short session during which I would quiz the esthetician about the salon, the service, how she got into that line of work, her weekend plans. It would be a peek into the world of beauty that would someday serve some sort of editorial package. To be honest, I really only accepted the invitation because I had an event that night — the Riverkeeper Gala — and being a pregnant gala-goer is tough. No drinking, achy back, cravings to be in bed with House of Cards … I needed something to bring back the spring in my wedge-heeled step. Eyelash extensions sounded like it would do the trick. Quick little pampering session, right? Luckily, the people at Caryl Baker noted my suggested appointment time of 3 pm might not be a good idea. In the end, I was at their stylish face-spa for over 2 1/2 hours! And perched on a stool I was not. When I arrived, the staff ushered me into a special room, about six feet by 15 feet, and asked me to fill out a fairly long form. (I’ll admit, I started to get cold feet at this point! I could never go through with plastic surgery … ) But the esthetician, Lianne, answered all my questions fully and with such confidence that I quickly started to relax. The reclining chair — located in a small, quiet room. Lianne explained that, while other salons might put three or four extensions on each lash, Caryl Baker Visage’s new Xtreme Lashes put one extension on each lash, which makes for a “natural but noticeable” look. She assured me that the extensions aren’t “heavy” and will only cause damage to the natural lash if you’re prone to rubbing your eyes (so not good for little babies who miss their nap, I suppose!). And then, I lay myself down for the process. The worst part: eye guards. These are little pieces of plastic that are taped on right below the eye (you know, where we show our lack of sleep.) The more she asked if they were itchy, the more they became itchy. I dug deep: I have given birth. I can do this. Another bad part: the sound of needle nose tweezers — and scissors, did I hear scissors? — operating very close to my eyes. The best part: the music, the room, the confidence and fluidity with which Lianne worked. At times she would put one finger on my nose, just to steady me/her. I fell asleep right away! The really, really best part: the end result. They’re 11 mm — that’s 2 mm longer than my 9 mm natural length, which I learned is the norm. I don’t wear a lot of makeup to begin with, but I almost always wear mascara. I guess I’ve always felt my lashes were quite short and thin. Of course, you can wear mascara with these extensions but it’s best to avoid a waterproof one, as so much rubbing is required to remove the stuff. But me, I think I’ll avoid the stuff for the month or so while these suckers stay on. In the end, the extensions did give me an extra thrill at the event that night, and I’ll enjoy looking a little more put-together. I don’t think they look fake — as my husband said, I just look a little “Disney-ified.” I’ll take that as a compliment! Plus, Lianne suggested that extensions are great for vacations, when you don’t want to spend a lot of time putting on makeup. Me, I think they’re great for pregnant ladies who might be feeling awkward about their rapidly changing bodies.